Shanta Behan Sanghani, the mother of the veteran cooperator from Gujarat Dileepbhai Sanghani died last week. She was 89. She had been suffering from breathing problems for the past few months. Several union ministers, state ministers and cooperators paid tributes to the departed soul. From the govt of India, Union Ministers Mansukhbhai Mandaviya and Parshottam Rupala paid their tributes. 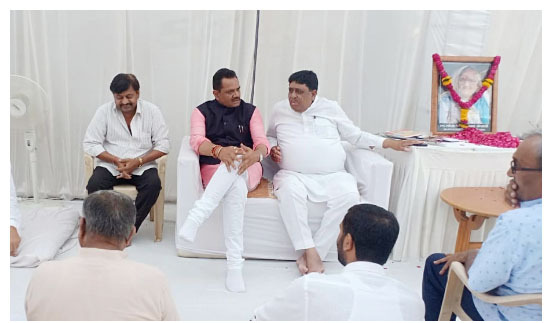 Gujarat BJP President Jitubhai Vaghani, Gujarat Agriculture Minister R C Faldu, NCUI Vice-President G H Amin, among others, attended the condolence meeting. Gujarat CM Vijay Rupani is also likely to visit Amreli to pay his tributes, said a family member of Sanghani. Several IFFCO Directors including its Chairman Balvinder Nakai, MD Dr U S Awasthi and others have sent their condolence messages as well. Sanghani is also on the Board of IFFCO, besides being the Chairman of GUJCOMASOL. Indian Cooperative joins others in paying tributes to the departed soul.